Acclaimed country rockers Old Dominion’s new album, Happy Endings, is now available for pre-order on iTunes and Amazon. 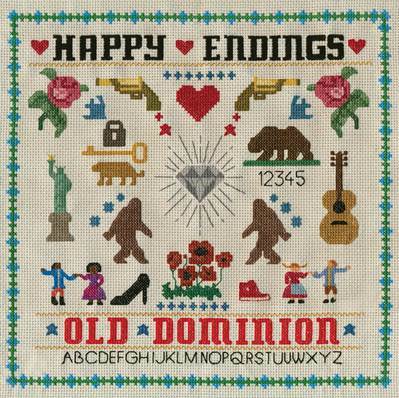 Old Dominion promises three more songs to be available for fans who pre-order Happy Endings ahead of its 25th August 25th date. On 21st July the clever, fun, up-tempo number “Shoe Shopping” will be available for instant download, the warming “Be With Me” on 4th August, and then finally “Not Everything’s About You,” which features the late, acclaimed songwriter Andrew Dorff as a cowriter, on 18th August, marking one week out from the full Happy Endings album release on 25th August. Ever true to their craft, Old Dominion appear as the primary songwriters on Happy Endings as they did for Meat and Candy. Proving that they are not your average country band, Old Dominion blends old-fashioned country charm, lyrical wit and rock n’ roll grit into radio-friendly, hook-heavy pop nuggets. The band has emerged as one of the hottest breaking bands in country music, fusing clever lyrics and an infectious sound. The band released their first full length album Meat and Candy, which is certified Gold in the US, and called a “deceptively smart, occasionally cheeky, stellar debut,” by Entertainment Weekly. The debut album produced their Platinum track “Break Up With Him,” GOLD hit “Snapback,” and single “Song For Another Time,” which hit No. 1 on US Country Radio charts.